The Rebel Sweetheart. : 5 Ways to be the Coolest Bride and Groom Ever. Although a wedding is primarily about the bride and groom, a truly great wedding celebration brings joy to a whole group of people. This includes the bridesmaids and groomsmen who work hard to make your big day great. Here are five tips to keeping your wedding party happy and properly thanking your friends for their help. No one wants to go bankrupt celebrating someone else’s wedding. 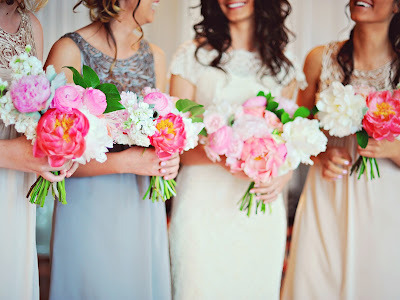 Think about the needs and budgets of your bridesmaids and groomsmen when you make your plans. If you’re planning a destination wedding, consider paying their travel expenses. Choose dresses and tuxedos that can be rented or purchased cheaply. Finally, don’t expect expensive gifts from your wedding party, since they are already contributing their time and efforts. Don’t ask your bridesmaids and groomsmen to wear something ugly, embarrassing, or revealing. You may want an unusual wedding theme or style, but consider their taste and comfort. Although the focus will mostly be on the bride, no one wants to look foolish in public. While the bride and groom may be thinking about nothing but their wedding plans, everyone else is busy leading their lives. If you schedule a series of events, including an engagement party, a bridal shower, and a rehearsal dinner, your wedding party may get tired of the whole occasion. Similarly, don’t obsessively call or email your bridesmaids and groomsmen. You may be filled with ideas or worries, but they are probably thinking about other things. Sometimes, a simple “thank you” is enough to show your gratitude. Better yet, buy a small gift of appreciation for each member of your wedding party. Most people would be happy with swarovski wedding gifts or other high end merchandise, available from stores like Cal Global USA. Make sure each member of the party is recognized, but be especially grateful to the individuals who help organize the event and bachelor or bachelorette parties. The best weddings start with a positive attitude. Your happiness will be contagious, so share it with your wedding party. Try to relax and enjoy your big day without worrying about little details. The bridesmaids and groomsmen have the power to make a wedding great. Treat them right, and they will give you a wedding party that you deserve. Great tips! We should send this out to all Bride and Groomzillas out there. :) They could use a push in the right direction. Affordability is a big thing for me as well as having fun and offering good food thanks for sharing your recommendations. A lot of couples get caught up with planning the wedding that they forget to enjoy it as well. It's really better when you're relaxed and ready to have fun! Love the tips! These are very helpful tips. I have a friend who planned her wedding all by herself. We offered to help her, but she declined. On the day of her wedding, she looked so tired and haggard. Good advice, planning a wedding is really important, it should be perfect because it's once in a lifetime. I'd like to spread and share this for those who will be married soon. Great tips!!!! I made sure my bridesmaids loved what they were wearing! I think these tips are really reaching the practicality and realistic sides of weddings and I appreciate reading them. Now time to be a friend and show this to my other bridesmaid for an upcoming wedding in a few months!